Proposal: Adamson Associates Architects l Henning Larsen Architects l PMA Landscape Architects. Rendering courtesy of Build Toronto. Build Toronto, in partnership with the City of Toronto, has announced Adamson Associates Architects, Henning Larsen Architects and PMA Landscape Architects as the winning design team selected from the Etobicoke Civic Centre Design Competition to design a new 46,500-square-metre (500,000-square-foot) Etobicoke Civic Centre as part of the six-hectare (14-acre) Westwood Theatre Lands redevelopment. 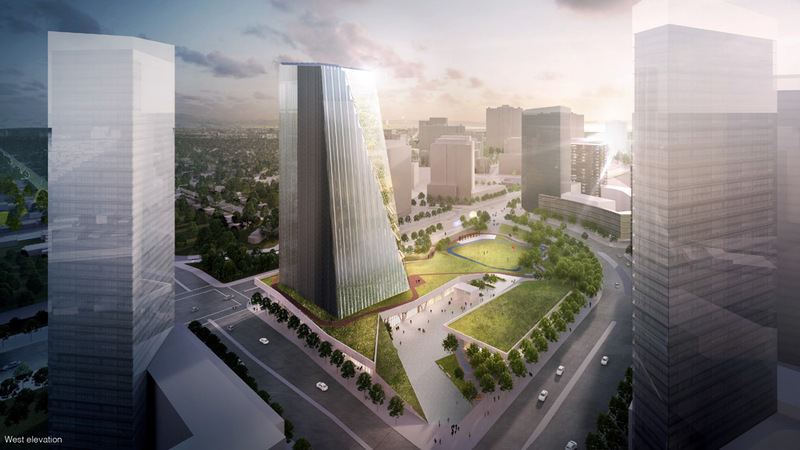 The winning design, developed by a partnership of architects from Toronto and Copenhagen, best satisfied the guiding principles established in the Request for Proposals, showing flexibility and an iconic design well suited for the community. “This proposal sensitively reinterprets its context of place and possesses a depth of design story beyond the skin of its built form. 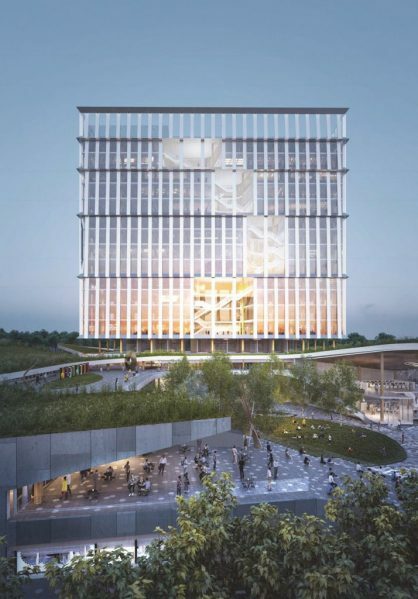 It showcases a unique ability to openly welcome and engage everyone in a setting that is both civic and communal,”said Gordon Stratford, Senior Vice President and Design Principal, HOK and the Jury Chair of the Etobicoke Civic Centre Design Competition. Four shortlisted design teams publicly presented their designs on Tuesday, April 25 to more than 140 community members, councillors, City staff and the project teams in the council chamber at the existing Etobicoke Civic Centre. Following the submission of community comments, the designs were then judged the following day by the jury. Moriyama & Teshima Architects | MacLennan Jaunkalns Miller Architects | FORREC Ltd.
Proposal: KPMB Architects (Toronto, Ontario, Canada) l West 8 Urban Design & Landscape Architecture (Rotterdam, Netherlands). Rendering courtesy of Build Toronto. Diamond Schmitt Architects (Toronto, Ontario, Canada) l Michael Van Valkenburgh Associates (Brooklyn, New York, U.S.A). Rendering courtesy of Build Toronto. Proposal: Moriyama & Teshima Architects (Toronto, Ontario, Canada) l MacLennan Jaunkalns Miller Architects (Toronto, Ontario, Canada) l FORREC Ltd. (Toronto, Ontario, Canada). Rendering courtesy of Build Toronto. 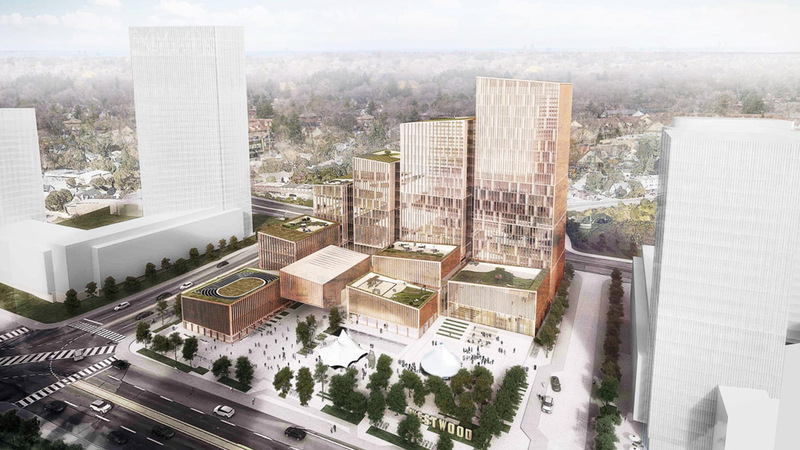 The new Etobicoke Civic Centre is composed of five program elements – municipal offices including gathering and civic function space, a community recreation centre, a Toronto Public Library district branch, a child care centre and an outdoor civic plaza. A new urban park, south of the civic plaza, will complement the outdoor civic function for new and existing residents. 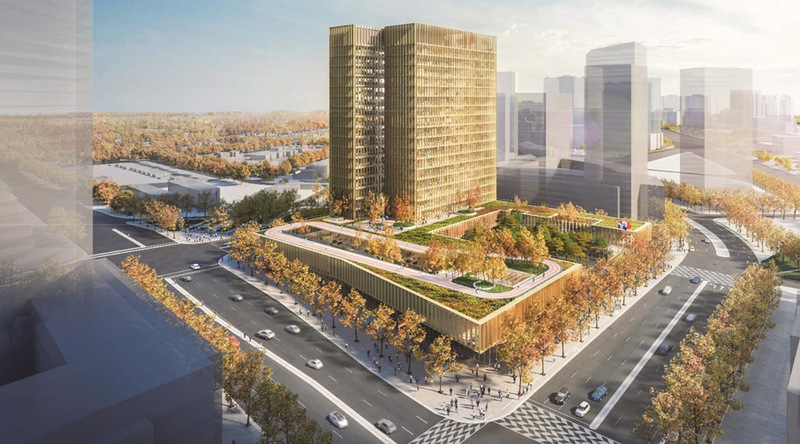 It will be located within Etobicoke Centre, one of four vital mixed-use communities that were identified in the City’s Official Plan as being where the city’s rapid transit network, where jobs, housing and services are concentrated.